It’s here! Readathon time! 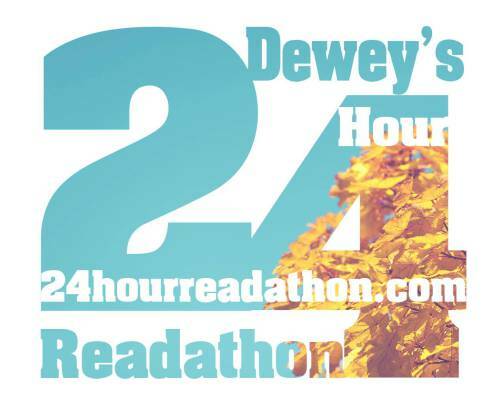 This is my first full-on participation in Dewey’s 24-hour Readathon in YEARS and I’m very excited to be here. I checked myself into a hotel for the weekend (woohoo!) and I’m soaking up glorious alone time filled with books, audiobooks, and my fellow bloggers! As usual, to avoid cluttering up your feed-readers, I’ll be adding all my RaT updates on this post. Note that most feed-readers don’t change with post-changes, so check back later in the day if you want updates! And now, my lovely booknerd friends, let the reading begin! 9:00 am – Just finished my first book (This is Where it Ends). Starting RaT strong! Now it’s off to breakfast with an audiobook and The Trouble with Destiny. Maybe some short stories as well! 11:00 am – Finished a second book! Nine Magic Pea-Hens, a fascinating collection of folk tales. 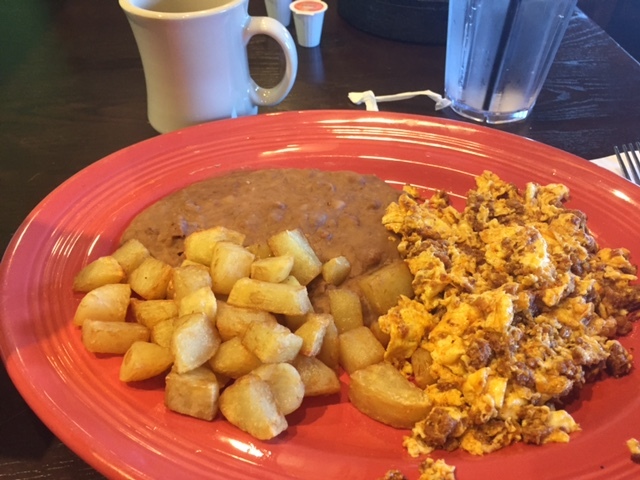 Perfect for reading while at my delicious breakfast (above), and to go along with a long walk and some audiobooking. Still going strong! 12:30 pm – Checking in a little earlier so I can get out of my hotel room before housekeeping arrives, ha! Having a lot of fun with The Trouble With Destiny at the moment. Fun books so far this RaT. 3:00 pm – Third book down! I have no idea why, but I love Lauren Morrill’s books so much. This was a perfect mid-day read! Switching my coffee to decaf now (heh) and going to get in some audio and exercise over the next couple hours. Hope y’all are all having fun! 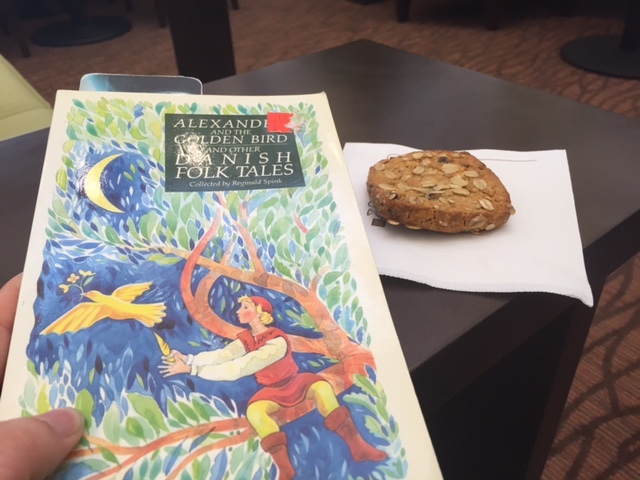 5:00 pm – Finished off another collection of folk tales. These have really made lovely collections for RaT. I’ve also been devouring crackers and jerky, plus the little snacks this hotel leaves in the lobby, mmm (above picture features a blueberry oat bar). Found a negative to the hotel situation, though: listening to the next door neighbors discuss detailed bathroom rules. Dear hotel users: please note that hotel walls are very thin. 8:00 pm – Well, I had my first bust of RaT. Started a book that didn’t turn out to be a good selection for quick reading, and decided to set it aside after 40 pages. I’m a big chunk into The Selection now, and that may or may not end up being my last book of this ‘thon as I’m not sure how long my eyes will last tonight. 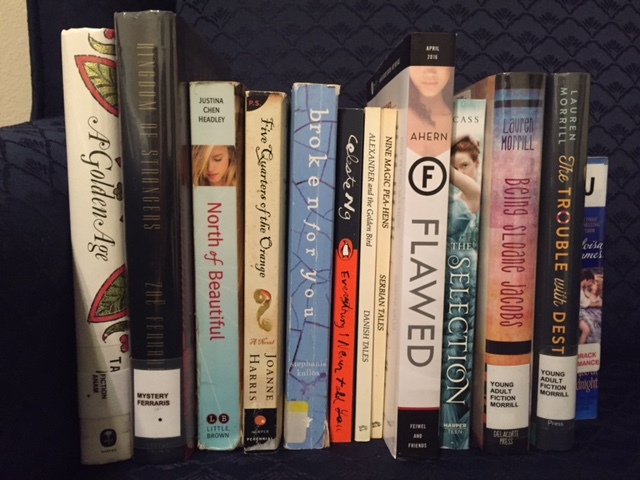 10:45 pm – Finished The Selection and now it’s definitely bedtime. I imagine I’m done for this particular RaT. It was a very satisfying experience. Beyond the obnoxious hotel neighbors that are all shouting away in the room next door…sigh. Maybe next time, I sent J and the boys all out of town and I get my house to myself all weekend, ha! I’m currently drinking coffee and relaxing against the headboard of a king-sized bed in a lovely all-to-myself hotel room in San Antonio, TX! Probably The Trouble with Destiny, though The Selection is a close second. I’m Amanda, a stay-at-home-mom and aspiring author with complicated and thorny health issues. I’m an agender, synesthetic, extroverted fitness-enthusiast who is highly passionate about many things. I just finished my most recent manuscript a week ago, so this RaT comes at the exact perfect moment! Last fall, I participated off and on all day despite also co-hosting an autumn party with my cousin, cooking for said party, hanging out with friends, dealing with my son’s band event, and drinking way too much wine. This year will be the total opposite: no family, no events, no chores, no cooking, no wine (or maybe just a glass, ha!). I am giving it my all this time! The Selection will likely be my only book in the second half. I was very distracted at the restaurant through dinner…just got back to my hotel room asap! That I’ve actually enjoyed going through this many books, including two story collections, which is unusual for me! Right around 9:30 pm and forward. That’s about when I turned into a pumpkin normally, so my eyes were all puffy and I kept getting distracted. I kinda missed the cheering by comments. I never got notification of cheers via twitter and only found them after the fact. Pretty much everything! The hosts did an amazing job. I gave up Everything I Never Told You about 40 pages in because I realized it was far too literary and slow for the Readathon. I didn’t dislike it, but for RaT purposes, it didn’t work for me. October is always a bit difficult since the ‘thon often falls on my son’s birthday weekend. So we’ll see. If so, it’ll likely be as reader again! Last but not least: A huge thank you to the lovely hosts of this event. Y’all rock! So fun that you are participating in Readathon! Who else is doing it this year? I haven’t participated in years. Looking forward to see what all you read! Have fun!! I think there were 1700 participants this year! Going to a hotel for the read-a-thon sounds so amazing, Amanda! You’re going to have a wonderful day. 🙂 Happy reading! Sounds like a great weekend! I might do this in October… It isn’t that my house is as hectic as yours, but it would be nice to take a mini reading vacation. Vacations are nice no matter how hectic your house is I think! I was a little peeved when the next door neighbors moved in and started providing distractions that way, heheh. I’m not sure about October either. It’s also a birthday weekend here. Really, October is a busy month for me anyway! For our family as well. Really, the entire last quarter of the year is pretty busy for us! Oh, wow! A hotel room to yourself for the weekend?? I’m quite envious. I had most of the day for readathon to myself, but I definitely could’ve done more/gone longer if I didn’t have to feel …uh… spousal guilt? Ha.